Review disclaimers are usually found at the end of an article or perhaps in the footer of a site, but I feel I should tell you what motivated me to read The Wealth Cure straight up. This book was given to me by a PR firm. They sent me an email describing the book and asked if I would review it on this site if they sent me a copy. I haven’t reviewed a book here at Money Cactus before. I’ve seen other sites do it and I like the idea, but I’m pretty selective with my reading and generally only read something that I really connect with. I don’t have a lot of spare time to read, so when I do get the time I want to read something I can either learn from, be inspired by or escape into. To be perfectly honest, I would have declined the offer if the book did not fit with the direction of this blog and my personal take on wealth creation. I’ve declined advertising and guest posts before because they don’t feel right, but The Wealth Cure interested me from the beginning. This book is a very personal account of the wealth creation journey of Hill Harper, CSI: NY actor and New York Times best selling author of The Conversation. After being diagnosed with thyroid cancer Hill reevaluated his view of wealth and what it meant to him. During a very symbolic cross-country train ride Hill reflects on the fundamentals values of life and redefines his relationship between money and true wealth. Personally I found The Wealth Cure to be a very enjoyable and inspiring read, I really didn’t think it would be as good as it was. To me it encompasses a lot of what Money Cactus is about and with some true to life examples, it is very easy to relate to. Reading The Wealth Cure I often caught myself thinking of a cross between the classic The Richest Man in Babylon and Robert Kiyosaki’s Rich Dad, Poor Dad. 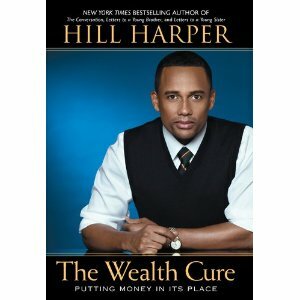 The book covers some very basic and fundamental rules of wealth creation, but Hill has found a way to reinvigorate the old and made it unique. What makes The Wealth Cure unique is that it is not just about creating financial wealth, but also about creating life wealth, which I feel is more important than anything else. The winner of the book will be announced via the Money Cactus Facebook page and Twitter feed this time next week. I’ll post the book anywhere in the world to the winner, so it truly is a FREE PRIZE. If you want to increase your chances of winning, get your friends or family to join in as well.